Sometimes with music, especially when you’re listening to a genre that’s not a personal favorite, an album just needs time to grow on you. You may give it a few listens and walk away without much, if anything, to say. When you return a second or third time, however, you realize the album is actually pretty good. 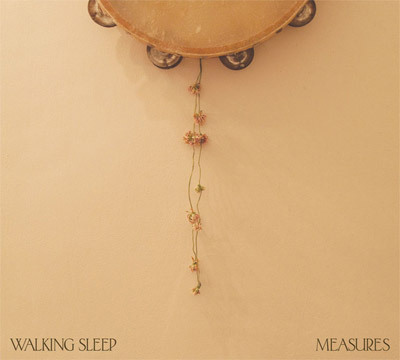 For me, Walking Sleep’s first LP, Measures, is one such example. I’m not sure if it was the six-piece band overload, or if I was unprepared for both male and female lead vocals, but everything was too much for me the first time around. It wasn’t until after a few listens that I began to fully appreciate the rock and early rhythm & blues combination that Walking Sleep delivers. New and refreshing, Measures is a nice surprise, if given the chance. Don’t have time to listen to this album thousands of times, like I do? Cut to track two. “In A Dream” owns a dark and marching bassline and introduces Hunter Curra and Sara Radle’s melancholic vocals perfectly. The dark sound also readies you for their love of lyrics, penned to either frighten or make one really, really sad. “In a dream one night you were choking me/ And now I can’t wake up.” Say what? Yes, this is about to be a voyage of emotions. “Standing In The Threat” is another stand-out single. The rhythm and blues-influenced sound is balanced out by sliding electric guitars and — always the instrument to ramp up the retro — an organ. What’s more surprising, however, is that we are introduced to a very soulful Radle going solo for the first time on the record. In a marked departure from the album’s two-vocalist formula, her honey-drenched voice is given a little room, adding subtle yet very delicious heart to the record. I listened to this album so many times it’s ridiculous, and “Arso” is a perfect example of why. Let me walk you through my dilemma. I was highly confused on where things were heading after the first few plays. Why is this catchy pop-rock song accompanied by the most tragic lyrics Walking Sleep could come up with? “Here’s your suitcase and all of your clothes/ We’ll have to burn all of those/ Here’s your guitar your book of notes/ What made you go on your own?” Clearly this isn’t supposed to be humorous, but it was! Someone’s missing and they’re so pissed they’re going to burn their suitcase. Slowly, I realized that it’s about loving someone who’s left without any kind of note tacked to the door, or goodbye letter delivered via bike messenger, and you’re just flat-out sad. And once I realized the song’s intent, so honest and beautiful, suddenly, I was actually sad. Thanks guys. Dark and mysterious at times, upbeat and sunny at others, and more often than not a blend of the two, Measures has nailed the job of keeping things entertaining and fresh. If you don’t like “feeling stuff” or “thinking things,” I’d say move along. However, for those of us who do, this album deserves your ears, maybe more than once.